it is a saturday, may 15 2010. one of the most despised players in german football, kevin-prince boateng, has left the bundesliga for good. and more, he has put his talent to work and reached the fa cup final with his already relegated team, portsmouth. boateng, who was born in berlin, where he grew up and turned pro, had recently decided to play for ghana, his father’s homeland, instead of germany, where his chances seemed very slim after various ugly fouls in and outside of the pitches. it was certainly not his luckiest day, in retrospect, when ghana and germany were drawn into the same group for the fifa 2010 world cup in south africa. at least not on may 15.
that day, he felt provoced by opponent michael ballack, a starter for chelsea fc in that final, at wembley. the next chance he got, boateng attacked ballack quite brutally. little did he know that he had just kicked the german captain out of he world cup. and maybe even out of his international career, as it turns out. schweinsteiger seems to have replaced ballack as main german player in the world. german midia went bezerk. special reports even in all channels and newspapers, ballack’s drama became the main subject for quite a few days. and boateng was the perfect bad boy, since he had that image even before the incident. germany had lost there one world class player, and to a player who would play against germany at the world cup, and who was even born in germany. no one could have imagined what would happen not even two months later. “prince” boateng became at least a little world star due to his good play for the best african team at the first african world cup. he will now play for milan, with the likes of ibrahimovic, pato, robinho and, of course, ronaldinho. on the other hand, ballack lost his job at chelsea, moved back to bayer leverkusen, and saw himself questioned not only by a good part of the public opinion, but also by his own national head coach. philipp lahm, questioned in a press conference if he would like to remain the captain after the world cup, used the timing right after the 4×0 victory over argentina to answer with a “i’m having fun and i like it, why should i not want to continue to be the captain?”. of course, that had sounded quite differently right before the tournament, where lahm had made clear that he was the world cup captain, but ballack was the national team captain. löw had said the same thing. so when löw was questioned by journalists about what lahm had said, they were surprised to find out that he would not give a definite answer to that question, and that he would think about some general things after the world cup. what a set back for ballack. and how unfair it seemed, after all he was injured and couldn’t defend himself. and he trully didn’t think he needed to, anyway. as a young player: successful at kaiserslautern. this last fact might seem misterious to many football fans who are not german. 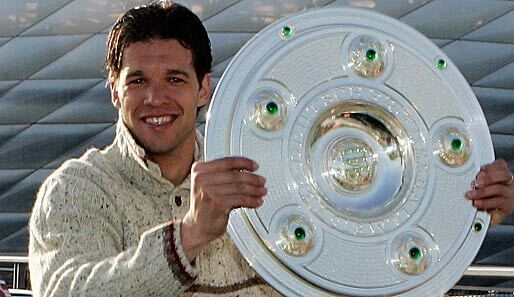 after all, what had ballack ever really achieved, as an individual and as a team player? his career began at kaiserslautern, where he moved to from his native chemnitz. in his first bundesliga season with the recently promoted 1.fc kaiserslautern, he became german champion in 1998, at age 22. one year later, bayer leverkusen acquired his services, and he young offensive midfielder started a little bit of a bad luck streak. at leverkusen, he had his best moments playing for clubs... but lost the champions league final to real madrid. in the year 2000, leverkusen needed only a point to seal their first german national title at unteraching, one of the worst teams of the season, but they lost 0x2 – with an own goal by Ballack showing the way. in 2002, leverkusen lost a 5 point lead in the last three rounds of the bundesliga, lost the final of the german cup – and where defeated by real madrid in the champions league final. 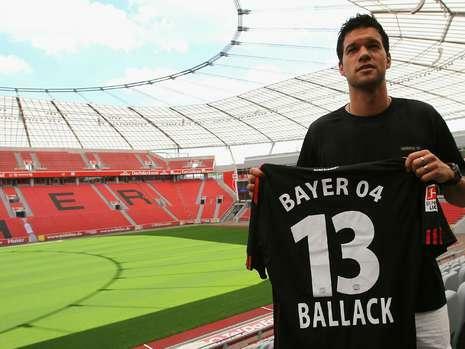 ballack, though, had an outstanding season, with great matches against liverpool and manchester united, and bayern signed him for the next season. at the world cup, he became germany’s darling by either scoring or assisting to all the important goals in the runners-up campaign of japan/korea 2002. in the semis, he became a national hero after seeing his second yellow card which would see him absent from the final, and still score the decisive goal for germany after the fact. it is because of that yellow card that the rules were changed, and a player has no yellow threat in a semi final, currenlty. 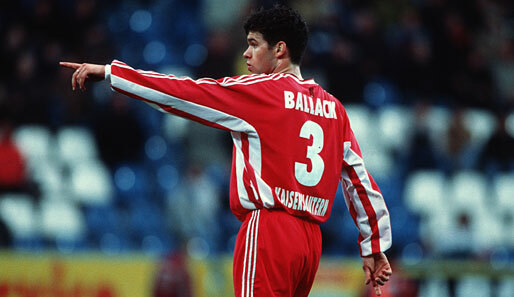 this had not been the true beginning of ballack’s legendary career playing for germany. that legend was born in dortmund, november 2001, when germany was facing elimination in the qualifying phase for the first time ever. 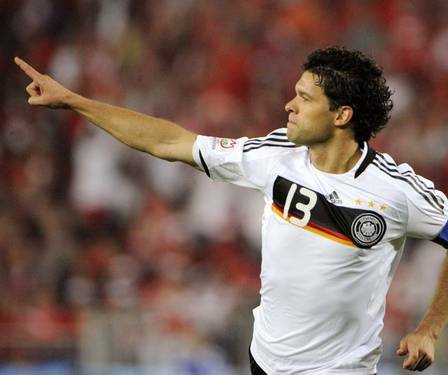 in the play-offs, germany had tied 1×1 in the ukraine, with a ballack goal. and in the convincing 4×1 home win that night, ballack was the saviour of german football, already hurt badly after the shame of the euro 2000, where a lackluster squad left the tournament without even scoring a single goal. always a leader for germany, on the pitch and in merchandising... the "handsome" michael. ballack mantained his status for the german national team over the years, and became its captain after the disappointing euro 2004 campaign. he was successful nationally with bayern, but never really loved by the munich fans. he scored quite a bunch of goals, some of them even important ones, but he was never the boss at bayern. in the german team, though, this was different. he had some great performances at the confed cup in 2005, and he was the emotional leader of a really good world cup 2006 squad. this international renomée led him to a chelsea contract, where mourinho offered him 9 million euros a year – and michael ballack seemed at the top, at least his salary was in he top 3 of the world. but he had never really played exceptionally well for his club since his leverkusen season in 2001/02, which ended with four runner-up places. he has won five national titles, four of them in the bundesliga, three of them with bayern. 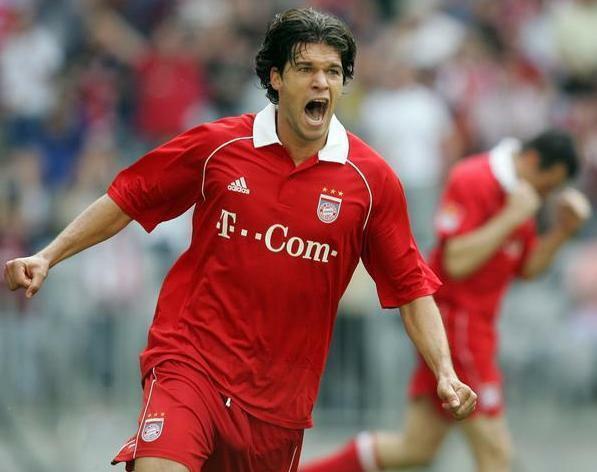 effective, but not loved: ballack at bayern. ballack played four years for chelsea. he wasn’t allowed to play as offensively as in germany, and defensively, he was outshined by the likes of lampard and essien, which is no shame; but it really shows that you are not superstar material. in the german national team, though, he was never questioned, and he was considered to be the one mega-star of german football. he did pay back all the confidence in usually convincing performances – and lots of goals! 42 in 98 matches is impressive for a defensive midfielder, it would be quite impressive for any striker, actually. and most of these were decisive goals. 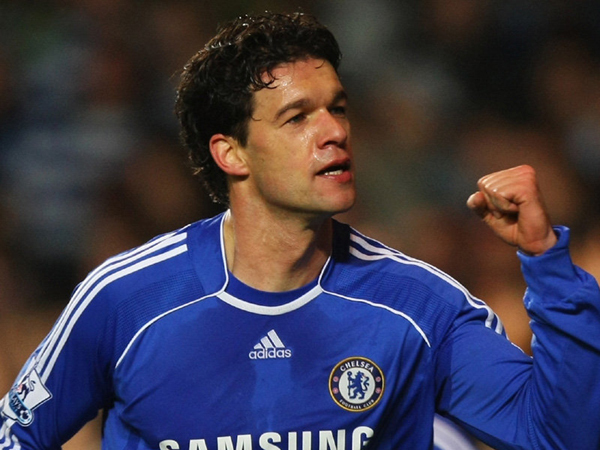 not always a starter in chelsea's star ensemble: ballack played four years for the london side. and then it was time for africa. no ballack. but what a great football from germany. the 4×0 win over australia had the whole world putting germany back into he title race after the first match, because of the way it was achieved, and not because of the result itself. even the 8×0 win germany scored in its opening match 2002 against saudi-arabia was a shadow compared to their brilliant performance, with fast and highly technical football, still with he typical german disciplin and team effort. and the 4×1 win over england, who had arrived at the world cup as favorites second only to the spaniards, was maybe the best football a german team had ever played in any world cup match – or any football match. who could’ve imagined that even more was to come, an incredible and deserved 4×0 against the argentinians, up to then the best team of the competition alongside the germans. who would have though that germany could play like that? and without ballack! all at once, he didn’t seem that important any more… even his replacement khedira got a contract at real madrid after south africa, a contract that would’ve pleased the aging ex-hero of german football. mourinho did say that ballack was always an interesting option, but he opted for sami khedira. and so did jogi löw, before the first euro qualifiers in belgium and against azerbaijan. ballack is not yet in form; in the past, that wouldn’t have been enough o keep him away from his national duties, as a captain and the only real star. but now, lahm (who is at least a little world star since 2006), schweinsteiger, müller and özil, even podolski and klose are quite well known themselves, and have quite a lot of merit in the recent developments. the change in perception of german football does not have the name ballack in it, an at the next euro, the “capitano” will be close to his 36th birthday. löw has chosen to give ballack the choice. if michael, back at bayer leverkusen, can reach world-class level for his club again (this was last achieved at the same club, eight years ago), then he might get back his place in the national team, and his captany. if not, his international career will be over, caused by kevin-prince boateng’s kick. good for germany, since only a ballack at top-level would help, but he would always be welcome. good for löw, who has the public opinion behind him, should ballack come back or not. actually, it’s quite good for everyone, even for leverkusen, who will have a motivated ballack, trying to show it to everyone. good for everyone, but ballack. he has lost his prestige, that he had earned mostly through his national team performances. he must get back to the top, and he has it all to loose. to me, it looks like he won’t make it anymore, and that philipp lahm is actually the captain of he german team, not only tomorrow against azerbaijan. but i would wish ballack that he makes his comeback, it would be definetly exciting to watch!